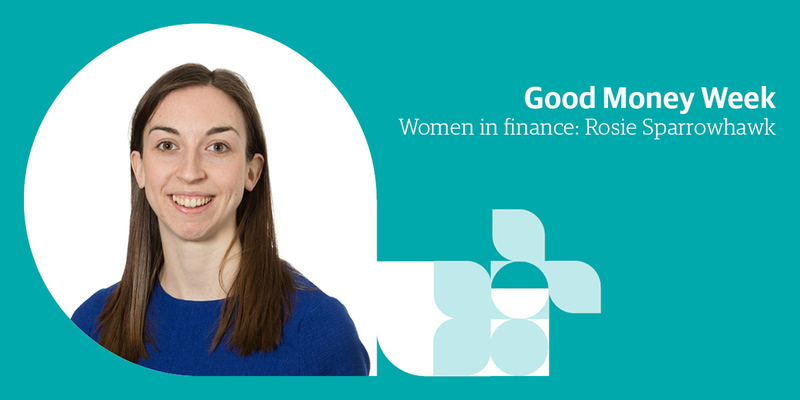 To mark Good Money Week, Rosie Sparrowhawk, assistant investment manager, shares her motivations behind her chosen career in ethical finance and her experiences to date. What motivated you to join Greenbank, professionally and personally? I studied mathematics at Manchester University and enjoyed the financial aspects of the course. After graduation, I wanted to explore a career in finance but with that ‘millennial’ sensitivity for social and environmental responsibility and the wider impacts of business. Searching for possible options, I was impressed by Greenbank’s engagement programmes and a screening process that encouraged greater corporate transparency and responsibility. Since starting with the company, I’ve become aware of a much wider range of social and environmental issues investors are looking to address and it’s been interesting to observe the impact of screening across a variety of sectors. Have you experienced gender bias at any point in your career? It’s difficult to think of a specific, overt example of gender bias, but I think it’s something that’s been more apparent in my day-to-day life. While the gender disparity is less visible at this early stage in my career, the drive to be more transparent about things like gender pay gaps within companies has made me aware of an historical gender bias that could affect me. I do think, however, that where there’s less diversity, the bias is more distinct and jarring, particularly when women who may require more flexible working arrangements rise to senior positions traditionally held by men. What do you see as the greatest impediments to gender equality in the workplace currently? I think one of the chief impediments to gender equality is the simple fact that people tend to hire others like themselves! I don’t think it’s necessarily malicious, but I believe people generally gravitate towards those of a relatable age, gender, ethnicity or educational background. A male-dominated board might therefore be a difficult thing for a woman to break into. By acknowledging this tendency, I hope that we can encourage improvement and change. Gender pay gaps also present a major stumbling block, particularly here in the UK where we tend to be extremely private about our earnings. I think it makes for an environment where such disparities continue to go unnoticed. However, hopefully this begins to improve given the recent legislation for companies to become more transparent on this issue. Are there any women in history or business whom particularly inspire you? The author and campaigner Naomi Klein. While she writes about a variety of issues, she was one of the first political commentators to link climate change with social injustice – that as the effects of climate change become more pronounced in the future, it’ll be the poorest in society who’ll be left with the fewest options to adapt. Klein also investigates how governments look to pass through legislation under the radar, particularly during significant world events like 9/11 or a major natural disaster. I think it offers a rather telling perspective on how the world sometimes works. How do you envisage the future of ethical and values-driven investing? Even though I’ve only been in the industry for three-and-a-half years, I’ve seen it expand rapidly and definitely become more mainstream. Every day I’ll read through the FT’s financial overview and find at least one article on ethical investment, mainstream corporate governance, sustainability or divestment. I think we’ll move further in that direction as investor demand increases along with continued pressure for greater corporate responsibility. I also believe that larger pension funds will respond more to that ‘values’ pressure over time and look to emulate what smaller, bespoke ethical funds are offering and achieving. Looking at the UN Sustainable Development Goals, I wonder too if those will become a spur for companies and ethical funds to find greater correlations between them and expand their own sustainability outlooks. Much has been made of the impact of the millennial generation. While I think it’s true to a large degree, it’s also important for us to ensure that the momentum we’re generating doesn’t stall – the movement for positive change in the world isn’t going to drive itself.